Ousted Sepp Blatter wished new FIFA president Gianni Infantino well after the 45-year-old was elected on Friday. 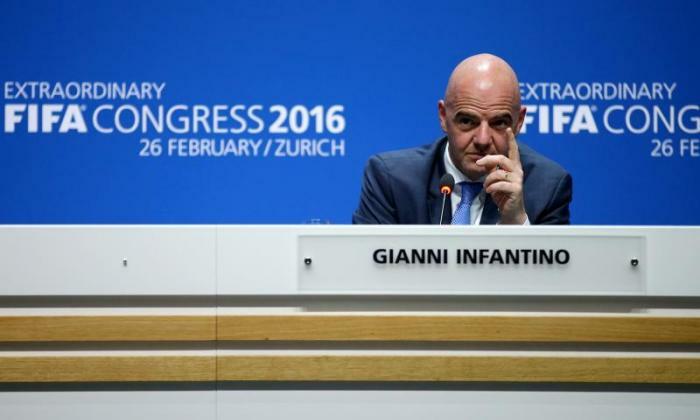 Infantino's victory came after a second round of voting at the world governing body's extraordinary congress in Zurich, as the 45-year-old Swiss lawyer saw off Sheikh Salman bin Ibrahim al Khalifa of Bahrain. Among those congratulating Infantino on his surprise victory was his predecessor Blatter, a man whose leadership meant the FA had ruled out attempting to draw future tournaments to England – with Greg Dyke hinting they will now resume bidding to host events. Infantino secured 115 votes to Sheikh Salman's 88 to become the second successive Swiss president, and takes over at a crucial time in FIFA's history. Blatter believes the right choice was made by FIFA members, and told German broadcaster ZDF: "I'm happy that Gianni Infantino is president, a man from (the Swiss region of) Oberwallis like me. I drank some mulled wine with him at Christmas time, gave him tips." Blatter was voted in as president for a fifth time last May, but he stepped aside days later amid allegations which led to a six-year ban from football-related activity, which he is contesting, strenuously protesting his innocence.